I have been accused as being an eternal optimist. :) I can understand the observation, as after all, when median prices dropped 4% last month I made sure that you knew that sales (quantity) increased by 44%. All kidding aside, I try to present things in a relatively balanced way -- helping you to see the hope you should have based on positive market indicators, but also helping you to see the reservations you should have given negative trends. Where do I see the market today and moving forward? I wish prices weren't still declining at a rate of 3% - 4% per year, but they are, so I make sure my clients are aware of that as they are buying or selling. I am excited that year-over-year sales will likely increase, showing some long awaited stability in the number of buyers in the market. I am encouraged that foreclosure are declining again in this area, which can inevitably only help the health of the overall market. What about you? What are your thoughts, feelings or observations about the current housing market? Optimists, pessimists and realists are all welcome here. I have been cautiously optimistic about the real estate market improving for almost four years now. Each year, instead of improving, the market declined. So -- would you like to know what I am predicting for the upcoming year in the Harrisonburg and Rockingham County real estate market? I am cautiously optimistic that things will start to improve. "As 2007 progressed, sales increased, and inventory levels decreased. In most price ranges, there is still somewhat of an oversupply of housing – but this will likely continue to correct itself in 2008. As we move through the first quarter of 2008, expect to see a continued gradual increase in the number of sales, and a continued gradual decrease in the inventory of available homes. The continuation of both of these trends will restore a healthy balance between buyers and sellers in our market." Was a healthy balance in the market restored in 2008? No. Things became worse. And then worse yet in 2009. And then worse yet in 2010. 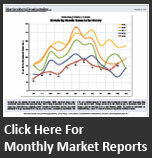 So where IS the real estate market headed in 2011? I believe the market will start to incrementally improve this year --- but again, I have thought that for years now, without my beliefs being born out in market realities. And yet as I look to the future and provide projections and predictions to my clients I try to strike a balance between totally unrealistic optimism and totally depressing pessimism. Several decades ago (and earlier) home buyers would wait to purchase a home until they had at least 20% of the purchase price saved up in their bank account, and they would only buy if they were going to stay in the same home and town for many years. At the time, the percentage of homes that were owner-occupied hovered between 40% and 50% (U.S. Census Bureau). Just a few short years ago, home buyers were buying with no down payment at all (or less), even if they planned to stay in the house for only a year or two. This led to an ever increasing homeownership rate, which peaked at 69.2% of families owning their home in the early 2000's (U.S. Census Bureau). Why the sudden change of pace? And what is a buyer to do today? Many of today's first time buyers are still buying with a very small down payment, and that can be o.k. Many loan programs are available with a small down payment, such as the FHA loan program which only requires a 3.5% down payment. The risk here is that a buyer doesn't have too much built-in equity in case they need to sell sooner than they think. Purchasing a $100,000 house with a 96.5% FHA loan results in a $96,500 loan, which has only been paid down to $95,000 one year later. With such a small down payment, it can be difficult to re-sell the home in a short time frame without bringing cash to closing. As becomes evident, the down payment and the length of ownership are quite intertwined. As shown above, a small down payment with a small length of ownership can be financially difficult. A small down payment with a longer length of ownership can work just fine. Conversely, a larger down payment provides security and makes even a small length of ownership feasible. What may become clear here is that homeownership is not for everyone. Even if you're making great money when you move to Harrisonburg for a new job, if there is a strong chance you'll be leaving again in 12 months, it may not make sense to buy right away. But for those with good credit, a down payment of some sort, and a solid job that will keep you employed and in the area for the next 3, 4, 5, 6, 7 years – homeownership may be a very exciting option for you right now. With low interest rates, lots of homes on the market, and many sellers ready to negotiate, this can be a most opportune time to act. Owning a home is a passive savings account of sorts, with money accruing as you pay down the principal of your mortgage each month. Owning a home also gives you the ability to establish yourself and potentially your family in a neighborhood that may be your home for years to come. Finally, owning your home gives you the ability to invest time, energy and money into your home that will provide a future resale benefit to you – as opposed to when you paint, re-model or otherwise improve a property that you are leasing. Now being excited about buying and thus owning a home, you might look around and realize that the local real estate market isn't booming right now. Median prices have dropped a few percentages per year for the last few years. Is the local market poised for a recovery? It seems that it might be, with sales volume possibly leveling off in 2011, but no one knows for sure. Is it wise to invest in real estate when the market, and prices are down? Many think that it is wise, given that you can fix your housing costs when prices are potentially the lowest that they'll ever be, and when interest rates are potentially the lowest that they'll ever be. In many ways, your housing costs compared to what you are buying couldn't be much lower than they are right now. Buying a home isn't for everyone, but excellent housing opportunities abound for those who plan to make the Central Shenandoah Valley their home for the years to come. A few days agoI provided information on the top 10 property owners in the City of Harrisonburg based on quantity of parcels owned, and total acreage owned. Today, let's take a look at the same breakdown for Rockingham County . . . This analysis does not account for the variety of property owners that own property in slightly different names or under entirely different entity names. Last week we explored who owns Harrisonburg, based on where those property owners currently live. Below are two additional slices of this data set --- exploring the top real estate owners in the City of Harrisonburg based on the number of parcels that they own, as well as the total acreage of the parcels that they own. The top two in each category probably won't surprise you . . . I did some basic grouping for the City of Harrisonburg and JMU to combine the parcels owned by each in different variations of their names. This analysis does not, however, account for the variety of other property owners that own property in slightly different names or under entirely different entity names. Who is getting involved in the conversations about local news and issues? One of the local blogs I read is hburgnews.com -- if you're not already reading it, you definitely should! One phenomenon that has been great to observe is seeing local government employees engaging in online conversations. I'm excited to say that we will be finished with the new Traffic Engineering Division website in the near future. The site will go over the basics of how the city's signals are timed and coordinated and will give everyone a look at the components used to operate a signalized intersection. We would love to hear everyone's comments and suggestions, which is why the new site will also include a comment form dedicated to signal-related concerns. I encourage everyone to use the new form when it is released. In the meantime, if you would like to follow up or have any questions, please feel free to call the Public Works Department at (540) 434-5928. Another great example of engagement by the local government is outgoing City Councilman Charlie Chenault's willingness to jump in to provide the facts or clear up misperceptions. I appreciate you, my blog readers, who often comment and provide your feedback here --- and I recommend you also read hburgnews, and jump into the conversations happening in that forum. It's a great way to not only know about the latest news in Harrisonburg, but also to be a part of conversations that will shape our area's future. Here's to open, transparent, responsive local goverment! When asked for my professional real estate opinion, I used to ask "Do you want to know what I really think?" Or I would find myself prefacing some of my comments with "Well, if you want to know what I really think..."
Over the past six to twelve months, I have had numerous conversations with buyers, sellers, builders and developers about the current real estate market. As such, I have dropped my prior vernacular from these conversations. For better or for worse, I'm telling people what I really think about our current market, or about their situation, proposal or property. Buyers, sellers, builders and developers need to know the facts within the context of their situation or property as they make huge financial decisions. Buying or selling real estate can be a complicated process at times, and questions often abound. If you have questions about the process, or about the market, or about some other real estate related topic, feel free to leave a comment below, or e-mail me (scott@cbfunkhouser.com) or call me (540-578-0102). Many of the topics covered on this blog are a result of questions that people like you have asked --- so feel free to step up to the mic to get your question(s) answered! Do Realtors Make Huge Profits On Home Sales? Josh posed the question of whether Realtors make extraordinary profits on home sales, and suggested I shed some light on the matter. I'd be happy to do so --- and I'll start with Josh's proposed example of a $100,000 home (though there aren't too many of those out there). One Quick Assumption . . . Upon the closed sale, Realtors are typically paid an amount derived from a percentage of the sale price of the property being sold. This percentage (the "real estate commission" or "brokerage fee") varies from company to company, from agent to agent, and can be negotiated. The sellers of all of the properties that I am currently marketing will pay either a 5% or 6% commission. Thus, for this example, we'll split the difference and use 5.5% as the sample brokerage fee. At First You Would Think . . . Many people would simply multiply the sales price ($100k) by the commission (5.5%) and assume that once I sell this fictional $100,000 home, I'd pocket $5,500. Could that be true?? "Sellers Agents" and "Buyers Agents"
The total commission that the seller pays is actually split (typically in half) between the Realtor representing the seller and the Realtor representing the buyer. While it is legal for a Realtor to represent both buyer and seller in a transaction, and many Realtors do so quite skillfully, it is not a practice that I encourage, as it can limit the representation that each party receives. As a result, and since in 95% (plus) of my transactions I am only representing one party, we will now divide the $5,500 by 2, and have $2,750 remaining. The remaining $2,750 is now split (again!) between the Realtor representing the seller (or buyer) and the company for which they work. Different companies have different arrangements as far as this split --- ranging from 50% to the Realtor to as high as 90% to the Realtor. Most companies are within the 50% to 75% range, so I'll average the limits of that range, and use 62.5% for our example. This leaves $1,719 to the Realtor. However, in my case, we pay a small percentage of each commission to Coldwell Banker Corporate (since we are a part of a national franchise), which actually leaves me with $1,616. If we are to compare a Realtors income to anyone else's income, we must next take out my business expenses. Last year (2007) my expenses were approximately 21% of my gross income. Some of these expenses are related to a single transaction (marketing costs, for example), and some are related to my overall business (Realtor association membership, MLS membership, office expenses, education/training expenses, etc.). Thus, the figure above ($1,616) is now reduced to $1,277. When we began, some might have made the assumption that I would have pocketed $5,500 on a $100k sale --- when in reality, I only profit $1,277. Along the same lines, someone selling a $300,000 home might think I would be pocketing $16,500 (wow!) --- when in reality, I only profit $3,840. Returning to the original thought/question --- do Realtors make extraordinary profits? In my opinion, no --- in some transactions I am paid appropriately for the service, knowledge, marketing, representation, negotiation and expertise that I provided to my clients. In some transactions, I am underpaid. And in some cases, I provide such services to a buyer or seller for months, and am never compensated at all (if they do not buy or sell). I hope this has shed some light on how compensation works in the real estate world (at least in my real estate world), and I certainly welcome other thoughts, questions, and perspectives!